The three Northern divisions had placement for the plate tournaments up for grabs in the final week, while two of the divisions were already sewn up. Here’s the 5 things we learned from the action! The final intrigue in the HNC Division One was who was going to meet the Comets in the promotion/relegation battle. Both the Silvercats and Colts were in contention, and the Colts managed to pick up the vital win over the Paisley Spartans to book their ticket! The Spartans were down to four players, after being let down by two of their travelling cohort. Their job will be far from easy though. We learned from the Broncos’ game-day that the Colts will be without QB Andy Brown, as he’s now taken part in two Broncos contests, rendering him ineligible for the Colts. Still, it’s a massive accomplishment for Camp Grangemouth, even if they don’t succeed in their bid for promotion. You’d have forgiven Carnegie for taking their foot off the gas in their final game-week. They had the two closest challengers in the Silvercats and Colts on the schedule, and only really had seeding to play for. Carnegie proceeded to put in arguably their two most complete performances of the season, winning 67-13 against the hosting Silvercats, and 69-2 against the Colts – the latter being their top score for the season. Carnegie have absolutely demolished their regular season schedule. The Colts in second have finished with a -10 points differential, while Carnegie boast a +429, conceding just over 100 points across the whole season, and scoring 532. They’ve earned automatic promotion to the HNC Premier, and have the Bedford Blackhawks in the first round of the Division One Championship playoffs! Heading south, the Warrington Revolution did the necessary work to seal their division crown with a 44-20 win over the Owls and a 34-6 victory against Chorley. The Revolution’s wins were enough to put them out of the Wigan Bandits’ reach. Warrington have a stern test against the excellent Tydfil Trojans at the Championship battles in August, however they’ll be more focused on their promotion battle against the Leeds Samurai looming in September. 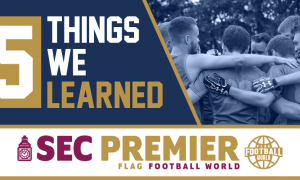 Leeds managed to cling on to their premier division status on a last second play – can the Revolution send them down anyway? 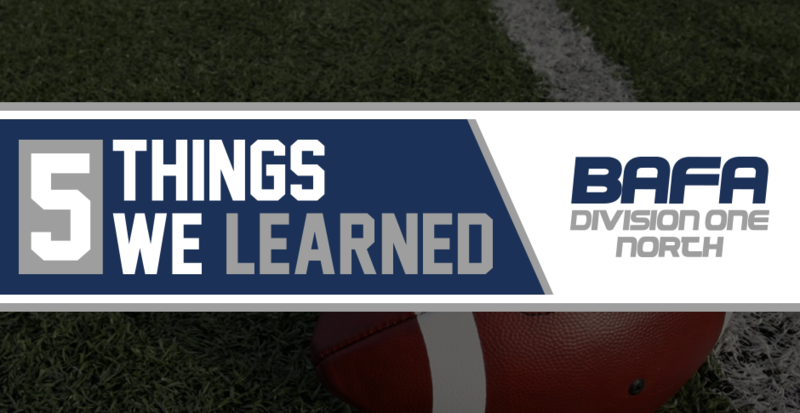 Division One East has been a bit of a canter for the Honey Badgers, as their 12-1 record shows. The battle for the spaces below them were heated, but the Nottingham Bears managed to come second with a strong 7-4-2 record. The well-drilled Sheffield Giants 2 made the Bears work for their 20-19 win, as did the Roosters, who only fell 6-0. 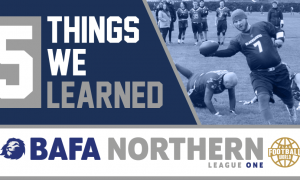 The Bears haven’t enjoyed too much success in the BAFA leagues in previous years, but we’re happy to highlight their winning season and efforts throughout the year! They’ve earned a plate spot, when many would have bet against them – they’ll take on the Reading Knights! 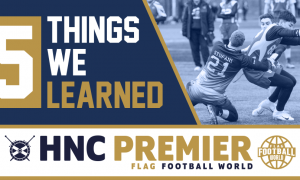 We had reasonably high hopes for Calderdale this season, as they looked to have some experience and ability that other teams in their division didn’t have. Unfortunately, things have come undone for the Knights, and the lowpoint of their season was surely the on-field dust-up at the previous game-day. The Knights, perhaps understandably, forfeited their most recent game-day, removing themselves from any post-season action and putting them on the committee’s naughty list. Where do they go from here? We hope the Knights get back to it next season. Forfeits are never good, as they hurt every team in attendance. They don’t really have priors for this, so hopefully this end-of-season has been a blip.